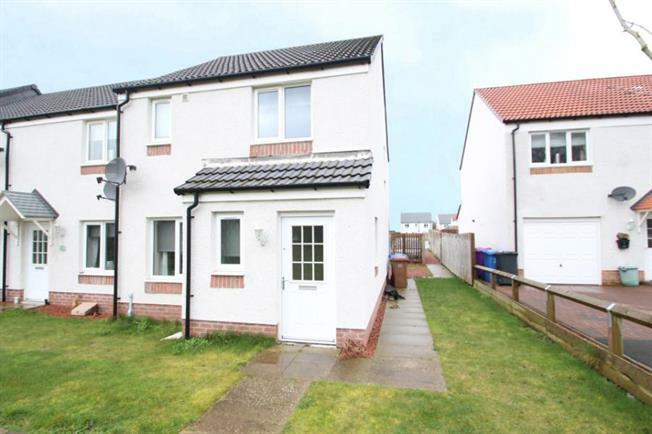 3 Bedroom End of Terrace House For Sale in Irvine for Offers Over £130,000. Ladyacre Court offers a well presented three bedroom end terrace villa. Situated in the sought-after Montgomerie Park development on the outskirts of Irvine this is an ideal family home. The property presents spacious accommodation with entrance hall, modern fitted cloakroom, lounge, modern fitted dining kitchen, three good sized bedrooms and a family bathroom. With the property being owned from new the home benefits from having a valid NHBC warranty and all original fittings. The ground accommodation provides a convenient cloakroom WC, family lounge with front facing aspect allowing plenty of natural daylight to the room. From the lounge you gain access to the modern kitchen/diner. The kitchen looks on to the rear garden which is fully enclosed by way of timber fence so it is child and pet friendly. It is laid with chips with a decking area providing an area to relax in. Access to the rear garden is gained through French Doors in the kitchen. On the upper level there is the master bedroom which provides en-suite facilities, the modern family bathroom and a further two bedrooms. The property further benefits from gas central heating.